Keep all your food deliciously fresh with this Food Vacuum Sealer Rolls. 3 Rolls to lock in the freshness! You can even put them in the dishwasher and reuse! 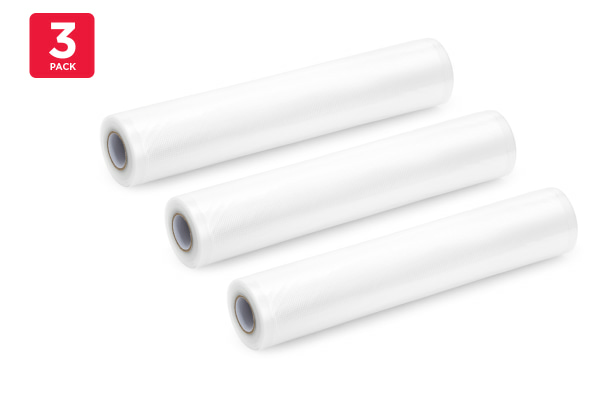 The 3 Pack Food Vacuum Sealer Rolls provide 6m of sealing goodness per roll for storing your meals and food. Cut the roll to the required length, pop your food in and use with any compatible food vacuum sealer to heat seal the edges. The rolls are made with quality BPA-free PE nylon material that features microchannels so you can expel air quickly. This soft material seals around food more tightly, keeping it fresher for up to five times longer than traditional storage. Once the food is sealed in the bag, you can boil it, freeze it, refrigerate it or microwave it.